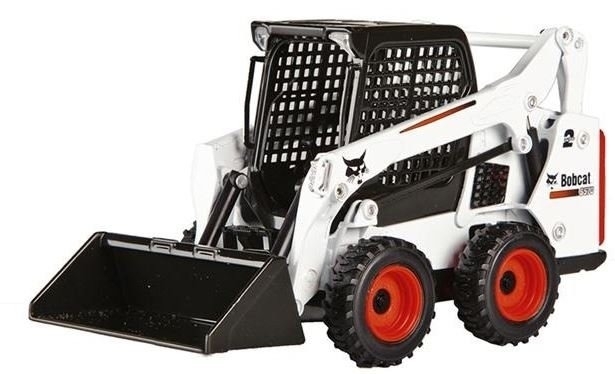 The Bobcat S570 is a tough vertical path skid-steer loader that will save you time when you need to lift, carry and excavate. This diesel-powered loader (formerly known as the 773 turbo) was upgraded to give you an extended, smooth-ride and comfortable operation. It's ready for attachments with an auxiliary hydraulic system that can push out 3300 psi and pump up to 26.4 gpm. The 61 Horsepower Kubota diesel engine with 2 speeds keeps you moving quick while optimizations to the turning radius keep you tight on fuel. This tough motor is also clean as it meets the criteria for EPA standards for Tier II engine emissions. There are lots of comfort and functional enhancements as this unit is focused on keeping you productive all day long. It certainly helps when they come equipped with features built with up-time as a focus. Just know that this machine is built to work and keep you working. Length with Standard Bucket: 130.3"
Height to Bucket Pin: 118.2"